South Africa has a resource with the potential to transform our economic and social reality. Unfortunately, we are missing this opportunity: It should go without saying that investment in children and young people is the source of future human capital. They should be at the forefront of strategies for economic growth and development in SA. But they’re not. The large collection of statistics describing youth in South Africa paints a bleak picture: one-third (over 3 million) of young people are not in education, training or employment; more than half of our children drop out of school before they reach Matric; and almost 60% of young people live in households below the poverty line. Yet, research shows that South African young people remain optimistic. They are determined, creative and resilient. As ordinary citizens, we should not use the government policy and systems argument to distance ourselves from the plight of young people. We have a prevailing public perception of young people as a ticking time bomb – an idle, unruly, and terrifying group of people who threaten the stability of the country. But, seeing young people like this is a generalisation – and a choice, one that affects their access to opportunities, while eroding our ability to help mould their social-mindedness, optimism and energy into a powerful force to drive economic development and social cohesion. If we choose to see the potential of young people instead of the threat, each of us has the power to support and connect with one or many of them, to grow their prospects, to ensure they can access real precedent-setting opportunities, and ultimately change the trajectory of the country at large. 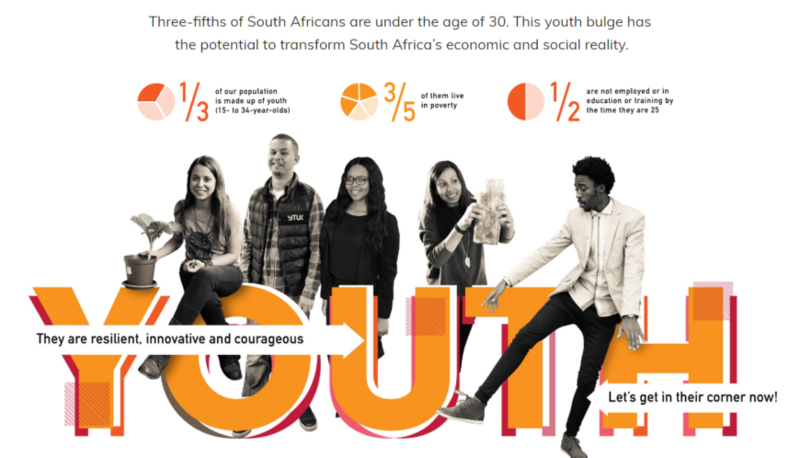 To this end, we have just launched ‘Create Change: Step Up for Young People’ – the third installment in our series of resources designed to equip individuals, communities and organisations with ideas, information and tools to help South Africans bring about the next big changes in South Africa. The ‘Create Change: Step Up for Young People’ website starts by helping us move past negative generalisations of young people by drawing us into their lives in an intimate and authentic way. The stories reveal the meaning of the statistics around youth in a personal way, but never let you lose the sense of the dynamism and tenaciousness with which young people are weaving their unique lives, regardless of the hand they’ve been dealt. A vast collection of research illustrates the effectiveness of mentoring in a variety of settings and especially the workplace. Based on this, the site provides a summary of the key success factors for mentoring, as well as a mentoring toolkit with talking and action points to help youth prepare for job-seeking, shine in the workplace, budget and save, as well as develop resilience. Young people are the parents of our young children, so building opportunity for them is crucial to breaking the intergenerational transmission of poverty. It’s time that we as citizens, companies, and decision-makers step up for young people and get into their corner – it’s the only way our people, economy, and society will flourish. Visit Create Change: Step up for youth here and please share it widely with those who might find it helpful.